Half-day excursion from Monaco or Nice. Arrival at Cap Ferrat by the lower cliff-road, from Nice, passing by Villefranche or from Monaco, passing by Beaulieu-sur-Mer. Combined ticket for the 2 villas. This splendid villa of the Belle Epoque also called Ile de France, was built in 1912 in the style of an Italian Renaissance Palace, by the Baroness Ephrussi de Rothschild, and by more than 30 architects. It is one of the most beautiful collections of works of art of the 16th to the 19th century, with an exceptional Sèvres china collection. Visit the villa with its splendid gardens, which surround the villa on 10 acres and overlook the splendid bay of Villefranche-sur-Mer. Enjoy a visit of the magnificient Spanish, French, Italian, Japanese, and exotic gardens.Count around 1:30 for the villa and the gardens. Bus parking in front of the villa. 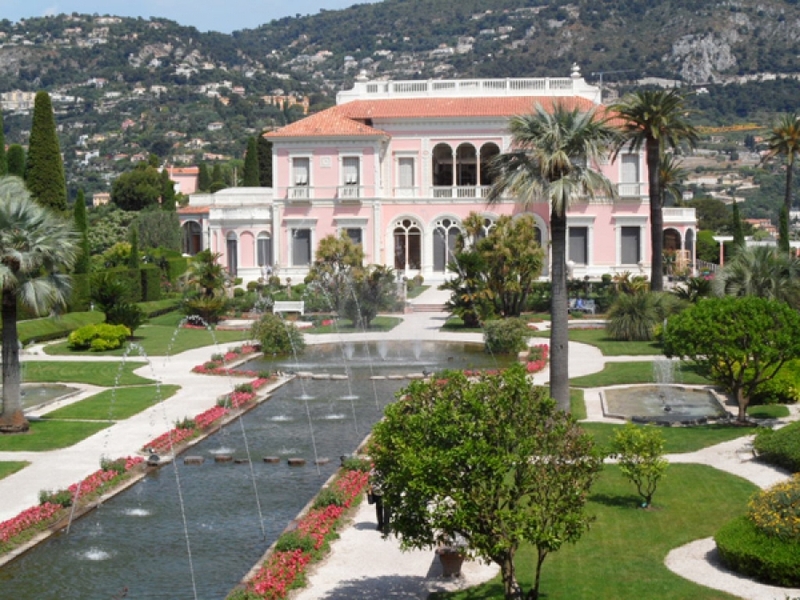 Count 15 minutes drive by coach to reach the Kerylos villa from the Rothschild villa, situated in Beaulieu on Mer. This villa is an exact copy of an ancient Greek residence and was created by Theodore Reinach in 1908 who was a brilliant anthropologist. You will enter right away in the authentic atmosphere of an aristocratic residence of traditional Greece, with its Baths, its main rooms such as the Andron, reserved to men, and its library made of lemon tree wood work. Count around 1 hour for the visit of the villa. Return by the lower cliff-road.